See Deploy Deep Security for steps that you must perform before proceeding with the steps in this article. Organize your VMs and Resources into an NSX Security Group in order to assign an NSX Security Policy to them. Before you begin, make sure you've followed the NSX set-up steps to deploy the appliance with NSX. In vSphere Web Client, go to Home > Networking & Security > Service Composer > Security Groups . In the Name and description options, give a name to your security group. Define Dynamic Membership: If you wish to restrict membership in this group based on certain filtering criteria, enter those criteria here. If a VM is included in more than one security group, the host record will be duplicated when you search for the name of the host on the Computers tab of the Deep Security Manager. For more information, please see Duplicate host records appear in Computer page when the host is located in more than one NSX security group. Next, you need to create a NSX Security Policy with Deep Security enabled as both anEndpoint Service and as a Network Introspection service. If you are using only the anti-malware or intrusion prevention modules, you will only need to enable the Guest Introspection service. If you are using only the web reputation, firewall, or intrusion prevention modules, you will only need to enable the Network Introspection services. In vSphere Web Client, go to Home > Networking and Security > Service Composer > Security Policies. Name and Description: give a name to the new policy and then click Next. If you do not configure Guest Introspection, the anti-malware and intrusion prevention features will not work. Service Profile: If you are using event-based tasks to handle the creation and protection of VMs, select "Default (EBT)". 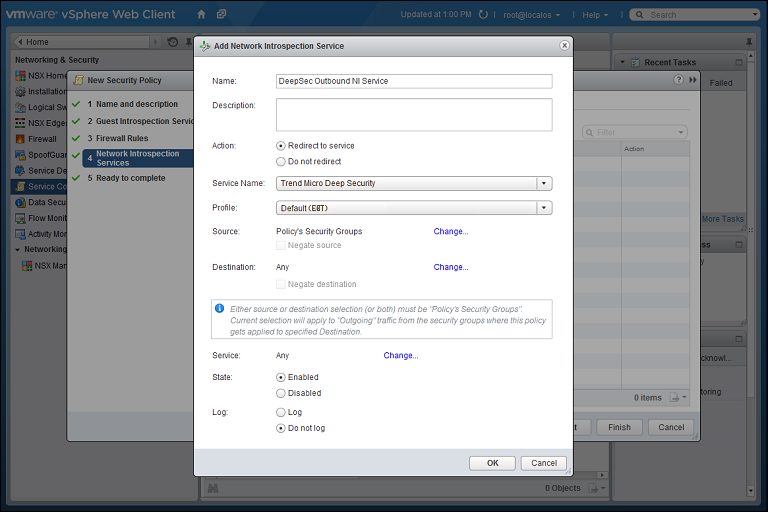 If you have synchronized your Deep Security policies with NSX Service Profiles, select the Service Profile that matches the Deep Security policy that you want to apply. Firewall Rules: do not make any changes. Click Next. 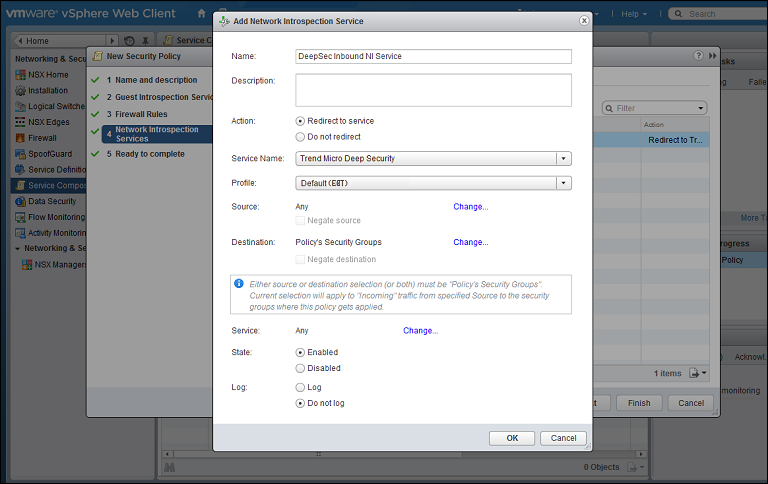 Network Introspection Services: You will be adding two Network Introspection Services to the NSX Security Policy: a first one for outbound traffic, and a second one for inbound traffic. 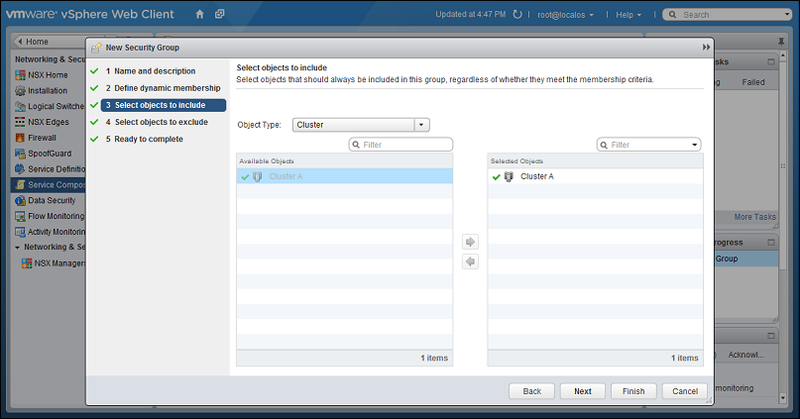 Profile: Select the same NSX Service Profile as you did in step 3. 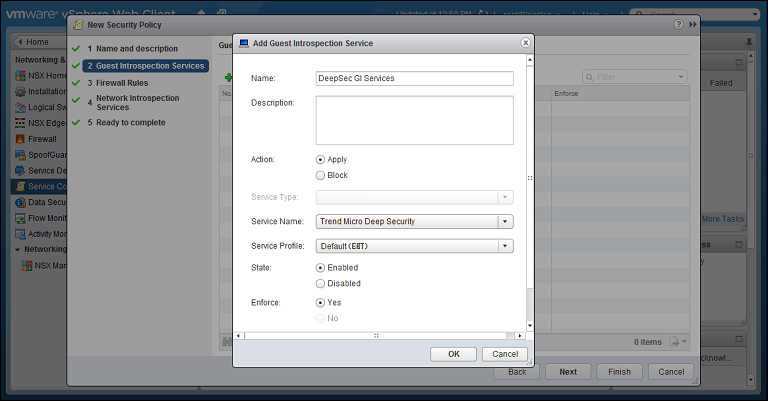 Click OK in the Add Network Inspection Service window, and then click Finish to complete and close the New Security Policy window. You have now created your NSX Security Policy for Deep Security. You must now apply the Security Policy to the Security Group containing the VMs you want to protect. 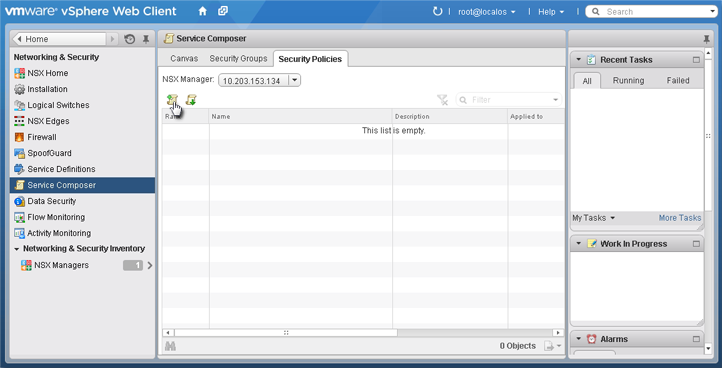 Stay on the Security Policies tab of the Home > Networking & Security > Service Composer page in your vSphere Web Client. With the new Security Policy selected, click the Apply Security Policy icon ( ). In the Apply Policy to Security Groups window, select the Security Group that contains the VMs you want to protect and click OK. The NSX Security Policy is now applied to the VMs in the NSX Security Group. When VMs are moved into the security group, they will get the NSX Security Group tag and the Deep Security Manager will automatically activate the VMs and assign the policy to them.